Q. Which is traditional Japanese confectionery that people in Kyoto eat on June 30th? hint: In Kyoto, around June is the rainy season, after which the real summer comes. The confectionery is made to look like something often seen in the summer. 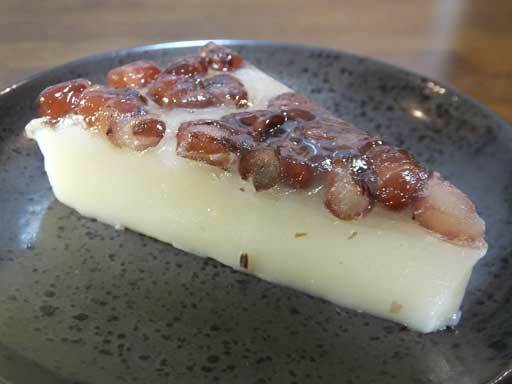 This is minazuki, a traditional Japanese sweet usually sold in June. Also, “minazuki” is another name of rokugatsu (June). It’s made to imitate ice, and poeple believe eating it allows you to survive the hot summer. Adzuki beans put on it are believed to drive away evil spirits. 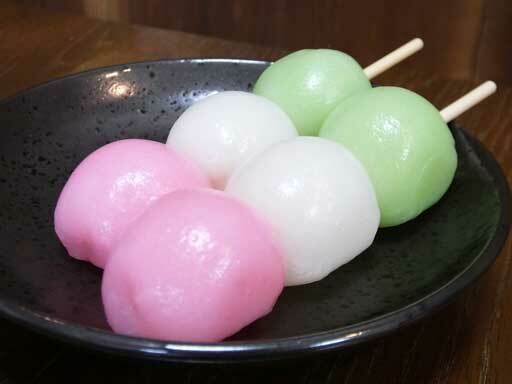 By the way, the other (２) is called hanami dango. “Hanami dango” originally means Japanese dumplings that you eat seeing cherry blossoms in the spring. These days, however, some people eat them when they want all year around.